The sewer line is well worth the low cost of anon-invasive inspection. If you are buying a home or it has been a while since you have had an inspection in your current home, call a plumber at John’s Plumbing & Pumps, Inc today to schedule sewer line inspection. We offer accurate information on the state of the sewer line so you know exactly what’s going on underground. If you are considering buying a used home or selling your current property, this information is critical to the process. A non-invasive sewer line video inspection is relatively inexpensive and is a considerable investment when compared to the cost of repairs. Sewer lines built up until 1970 were constructed of clay, concrete, and orangeburg. These materials are not able to endure as long as the more modern PVC pipes. When natural shifting occurs or tree roots place pressure on the lines, they will crack or begin to leak at connection points. Homes built before the 1970s should make regular sewer line inspection a part of their annual home maintenance to prevent expansive damage from going unchecked. Sewer lines are prone to many potential issues. These include things like shifting, blockages, and pressure from tree roots, to list a few. 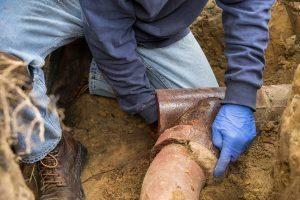 These issues can especially cause problems for sewer lines that are made from older materials. It is important that the sewer line from a home, connecting it to the main city line, is in good condition. When it is not, it can lead to leaks that leave unsanitary pooling in a yard or backups in the home. Individual business owners and homeowners are responsible for the side sewer line that connects to the main city line. What can a sewer line inspection show? When your plumbing is not properly draining into the sewer lineand away from your home, it can cause a backup that then put stress on much of the plumbing system. The pressure created by this stress can cause fracturing and leaking in other weak areas of the plumbing. Our technicians have specialized equipment for sewer line inspections and are adept at using it. We are able to give you a full and accurate report of any current or potential problems with a sewer line.